Does it need to be expensive? I have devised what I believe to be the best low-traffic cycle route from the Channel to Paris with minimum mileage. It makes use of the Avenue Verte disused railway south of Dieppe and well-surfaced forest paths through the outskirts of Paris, using the Bois de Boulogne and arriving a mile from the Eiffel Tower before emerging onto city streets (with even the last mile through a quiet district). Joined to Chris Smith's well described route from London to Newhaven, it makes a 200-mile low traffic cycle route from London to Paris. THIS ROUTE was invented in 2007 when Donald Hirsch and JB Lim set out to lead a local group of cyclists from Guildford to Paris. Here's my story of the route and how it has developed. THE OFFICIAL full Avenue Verte route from London to Paris is more circuitous, especially going into Paris. Here is my latest information on that route. HERE IS A NICE CHARACTERISATION of my route posted by one of its fans, Dominic Irvine, who holds the world record for cycling from Lands End to John O'Groats on a tandem. "Donald Hirsch’s route is an inspiration. Riding through sun dappled tracks in forests for miles and yet being in the heart of Paris are some of the delights of the route. The journey begins following a tarmacked disused railway track for the first 35 miles, climbing up an imperceptible incline before rolling over gentle hills towards the capital. The middle sections follow roads, quietly passing through sleepy French villages. Closer to Paris the route once again picks up the cycle paths until just a couple of miles from the Eiffel Tower we reach cobbled streets... En route it is impossible to resist a quick whizz around the cycling hippodrome, like a moon orbiting a planet, before breaking free of the gravitational forces and sneaking through the backstreets and cycle paths of Paris." My printable guide to the route gives detailed instructions and maps. Here's a suggested way of carrying it. The route on bikely.com shows it on Google Maps, allowing you to zoom in on detail. A layered map produced by Peter Kidd helpfully locates places to stay. For GPS users, these GPX files plot the route more accurately than was possible at Bikely. They're also published as a my places map, and as a free app kindly made available by Brian Nightingale: select >200k routes at Dieppe. 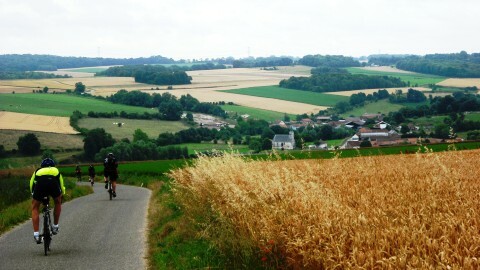 The hundreds of riders who have now done this route have particularly enjoyed the forests going into Paris. If you follow the directions through these forests carefully, you should not get lost, but just in case you do, there are some points listed that you can ask your way to in order to get back onto the route: this is preferable to trying to find your way into the city on very busy roads. To continue on from Paris, check out this helpful website . For the most ambitious, you can cycle "around the world in 25 years" (or rather to Australia in short annual hops) with this company which originated in a charity ride to Paris along my route. If heading towards Spain, you may be interested in this route developed by "Paulo". It is a very quiet route making the most of cycleways and minor roads. What kind of bike? This route can be done on pretty much any bike - there are a few tracks with some bumps, but the vast majority is paved or very smooth, and it's been done on a lightweight road bike without difficulty (though I prefer a hybrid or touring bike). For a closer look at the surfaces near Paris take a look at these videos. In 2007 it was done by unicyclists! Numerous people have done it on tandems and other contraptions. How long does it take? That's up to you. These itineraries give some ideas of stages from 1.5 to 3.5 days from Dieppe to Paris - a distance of 127 miles. London is a long day (60-70 miles) from Newhaven. From here, my preference is the morning ferry to Dieppe followed by a half day of about 40 miles, plus a full day of 50-60 plus a half day of 30 into Paris and back on Eurostar. A more leisurely pace allows an extra day or so. But there's lots to see along the way, and people who have made it into more of a holiday of anything up to a week have not regretteed it. You may especially want to explore the peaceful and scenic region of Bray - here are some pointers (including info about how you could buy a home here!!) . It's also been done as a family holiday with children. Is there a best time to go? It's rideable throughout the year. Arriving on a Sunday in Paris, there's the pleasure of using some of the embankment expressways when they're closed to traffic. On the other hand, I found one stretch of D-road (the 15 miles north of Marines) much quieter on a weekday than at the weekend. Supermarkets and shops are generally closed Sunday afternoon, and often on Mondays too, though I found a particularly useful supermarket open on Monday in Menucourt. Wednesdays are also difficult for shops and cafes in the Bray region (but cafe and boulangerie open in Gournay). Things can also be difficult on public holidays - especially 1 May and 15 August; also possibly 8 May, Easter Monday, Pentecost (7 weeks after Easter Monday) and Ascension (the Thursday before six weeks after Easter). Where should I stay on the way? There are plenty of recommended places in my accommodation guide (and if everyone who uses this route could send me a couple of lines on where they stayed and what they thought of it, I can keep the ratings up to date).